So, the time was once when we had PDAs and phones, and then they were merged together to make a 'smartphone' (I won't even get into how they tried to start up the 'superphone' moniker); and then we came a long and had smartcameras, and smartwatches... All the while tech companies like Google, Apple and Amazon have tried to take over your living room with SmartBoxes (AppleTV, GoogleTV, Android TV, Fire TV, etc... ). All the while we've seen and some people have SmartTVs. They've been around for a while, and I've usually railed against them with the logic that I don't want my software to get outdated on longer lasting hardware. I'm that guy that has TVs for much longer than most other tech. Same goes for my audio equipment. 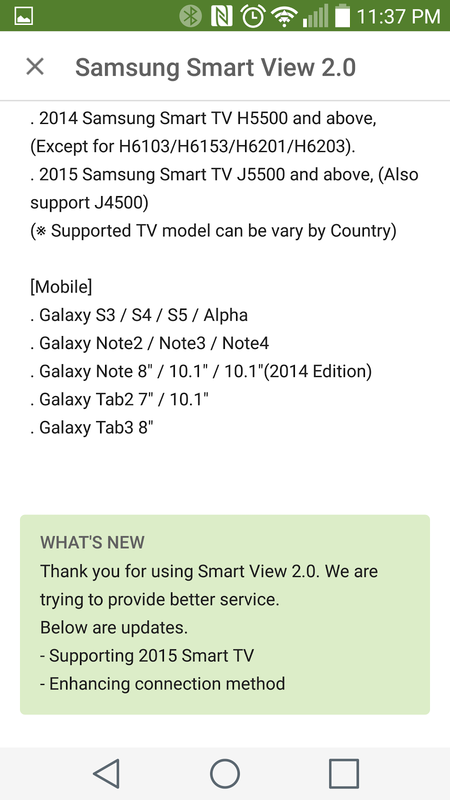 Anyways, my opinion's now changed after viewing the latest and greatest of the SmartTVs. I have to admit, I was fairly reluctant to review it, as I didn't really see the angle of an Android blogger playing with home electronics (although that line between personal tech and home electronics is becoming ever more blurred). But I was also interested. 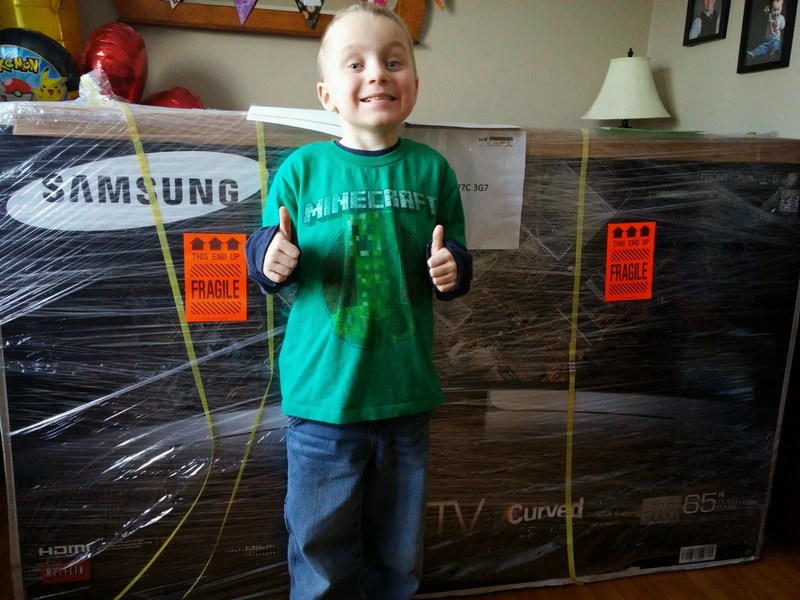 So one day a delivery man came to the house and had a team of them bring in the Samsung 64" 9000 Series UHD TV (UN65HU9000F). It was huge. We have a small front room, and my wife just laughed and laughed, and refused to let it be opened up in that room (she didn't want us to get robbed because someone could see it in the window). So I had to get a friend to help me lift it down the stairs into the TV room. It's not heavy, it's just definitely not a one man ordeal. But since getting it into the house, my wife has even welcomed it and has offered me many a scheme to get it to stay. So what to talk about this device. Let's walk through my set up. As I said it took a friend and I to get it downstairs, and in order to connect it to the foot/stand they recommend you keep the styrofoam on the front (you don't want to be putting this thing down on the curve). In the box was an intimidating box of accessories. 2 of them actually. 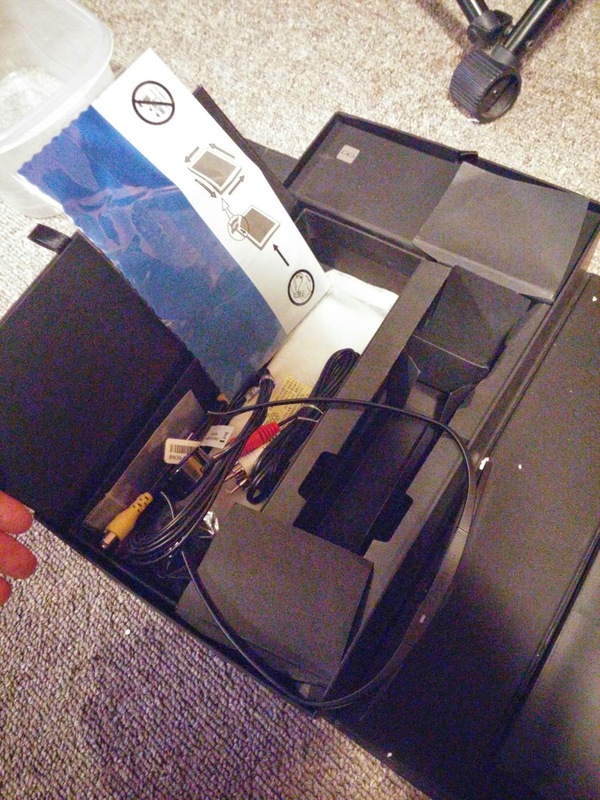 One of them had the remote, some cable adapters, IR extender, and 3D glasses (more on them later) and the manual. The other had a very heavy funky bar that you use to connect all your connections. This thing is pretty cool, and it makes sense. If you were to hang it on the wall you wouldn't want to have a million cables all going up the wall, so it's one box that handles all the switching for you. It isn't just 'digital' connections as it came with an adapter for my Wii to use RCA (or it could be used for compenent YPrPb as well). If I were to get this TV, I'd have to upgrade my DVD player as it's component only - but I can't find a newer one that handles DVD-Audio. There's also a couple USB ports, and I'll tell you, it's been able to run just about any video I've thrown at it. 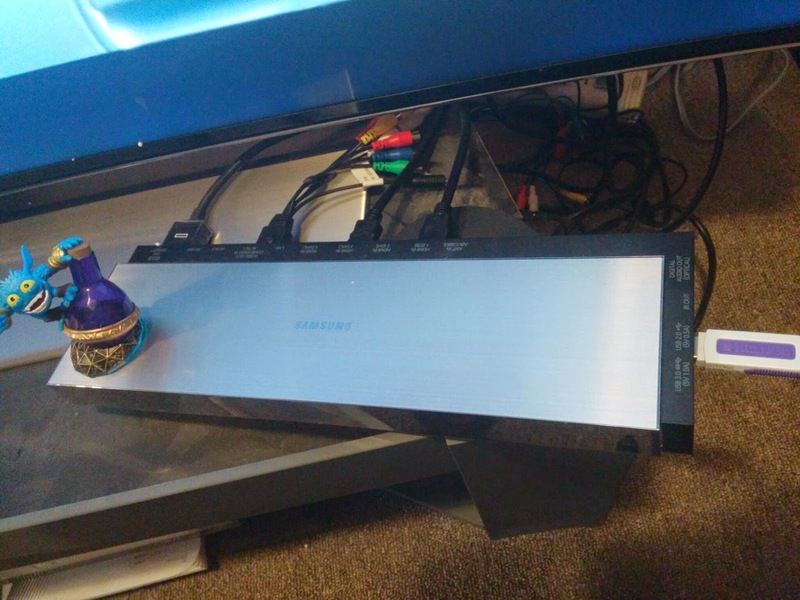 After getting the hook ups done it took me a while to figure out why the remote wasn't working. Sure it's got some IR functionality, but the majority of how the remote works is done via ... what I'm assuming is Bluetooth, and you have to get the device to pair with the TV by holding a couple buttons (I found out after assuming that the batteries might be dead and needing replacing - the instructions are there). 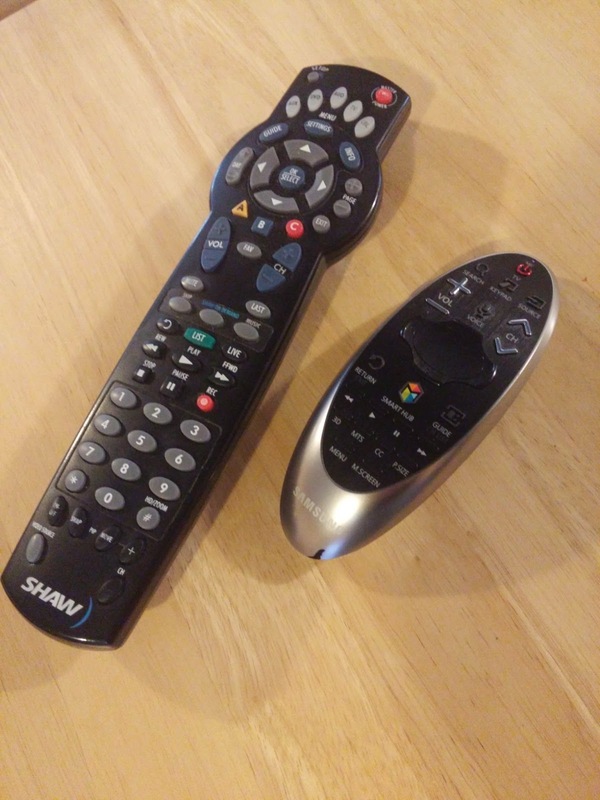 What I liked about the remote is it's size. It's not a huge intimidating remote, it's the size of your palm, very easy to hold and the buttons look simple (even my mom liked it). But it also has the option of being able to be used like a Wii-mote and point at the screen to move a pointer through your options. 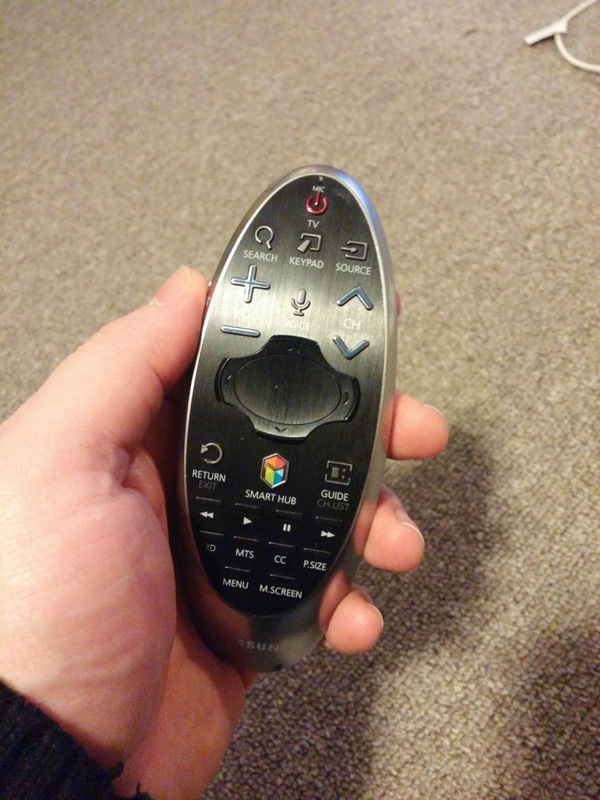 THIS IS THE FUTURE OF WHAT ALL REMOTES SHOULD BE FROM NOW ON! Just unfortunate that the pointing feature didn't work in some of the apps. which would you rather use? Now I could walk through the few screens to set up the TV, aside from connecting to the WiFi, primarily it just asked you where you were and what cable provider you had. It does this not only so that it can download it's own on-screen guide, but so that it'll program the remote for you to change the channels. If you've got a PVR, make sure you de-link the power options (i.e. so that when you turn off the TV it doesn't power down your PVR too). If you'll be using the PVR and not have it where the IR from the remote can see it, you can use the IR blaster/extender. That way any commands you send via the TV remote can be sent from the TV through the extender and to the device. This will come in super handy when you use the companion app (more on that later). First, let's talk about the size. It's 65". From my old TV days, I would recommend (and was highly touted by all our sales reps) that you would need 3x the size of the set to be able to sit back from it. Partly it was due to the fact that if you were closer you might be able to see the scan lines (now, we'll say pixels), but also at that distance your eyes wouldn't have to naturally 'move' to be able to take the whole set in. 65" x 3 = 195" or 16'3"... I don't have that... well not without rearranging my TV room. In the box in some of the set up they actually suggested about 18'. But you can make do with less, it just becomes a very overpowering experience. For me at least. 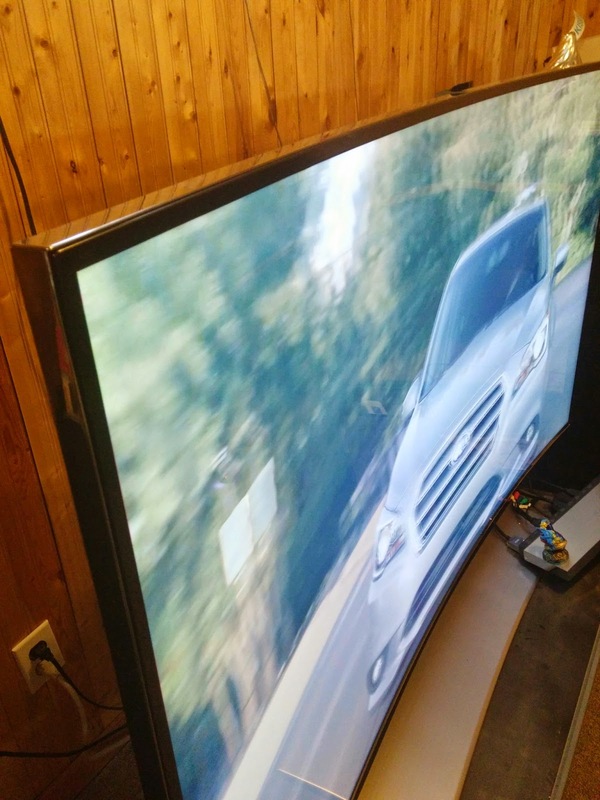 My wife really liked it - when she used to say 43" was too big for the room, she's now saying "this is the right size". Oh, and the curve. What does the curve do for the TV? Well, for me I've found that it just sets the realism level a little higher; but you need to be a little closer to experience it, whereas I like to be able to hang back. Now you can watch TV, and our Shaw HD looks alright. Definitely better than my older TV, but not OMG WOW over other 1080p TVs I've seen. There is an improvement, but ... really the source media can only take you so far. So let's see where I can really see the difference - with movies and YouTube. Let's jump into the Smart Hub. 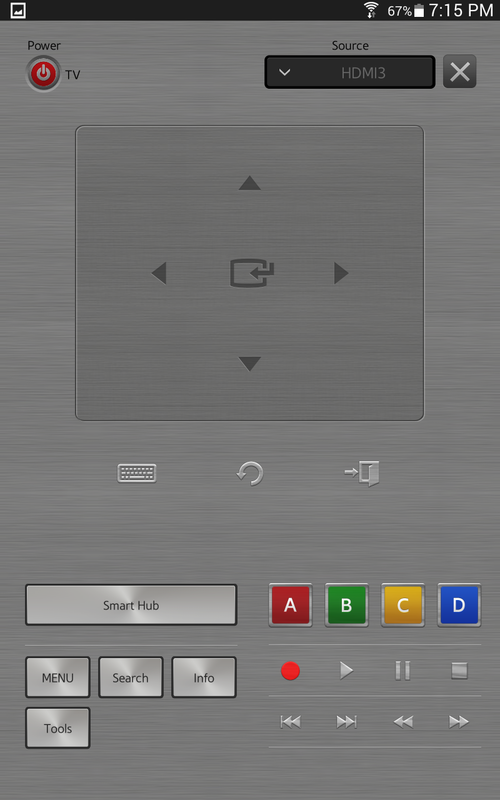 It's a little button on the remote that allows a mini menu of apps that it has to appear on the screen. In the settings you can adjust what will show in that little bar, and install a bunch of others from the Samsung Hub. Nothing super exciting here, just the typical types of web video apps (DailyMotion, Vimeo, Netflix, Youtube, Angry Birds TV...) and then some others like news channels and the Weather. For some reason when it was set up Netflix and Youtube apps from their SmartHub wouldn't work... It kept saying I needed to log in, and I would try but it would fail. I eventually just reset the TV and they then worked without even logging in to my Samsung account. First things first let's try YouTube and find some "4k demo" videos. I was blown away. I remember when I got my first HD set and it was 1080i and we would show it off to people how it looked. The difference from regular TV to HD was great. The difference going from HD to 4k is like an order of magnitude more so. Okay, so that's just demo samples. But even watching some other youtubers that film in 4k the picture was just amazing. Let's get into movies, I put on a movie and WOW. I watched Black Hawk Down, a movie from 2001 - and it was just amazing (even 1975 Jaws on the AMC channel was very good). I started watching others and then started to bring in friends and family to watch something, and everybody had the same reaction. It was as if we were watching the movie while they were filming it... like we were there in the studio. It was so real. It was better than anything I'd watched in IMAX. I kept making the comparison that it was always so naturally lit. Now some movies this could be seen as a hindrance. We watched the Hobbit and the parts where there's CG is definitely noticeable compared to the filmed portions. Not that you'd complain, it was awesome. One thing I did notice was that sometimes on the Netflix app there was a bit of an audio issue - whereas if I ran the video through my Nexus Player and it's Netflix app, that issue wasn't there. Don't know why. Speaking of using my Nexus Player - playing games on this big of a screen is so immersive. And the quality was still there. Pretty amazing stuff. We've all been to the theatres, and I've even seen some 3D TVs before. This was a very cool extra feature that my son just LOVED. My folks really loved it. 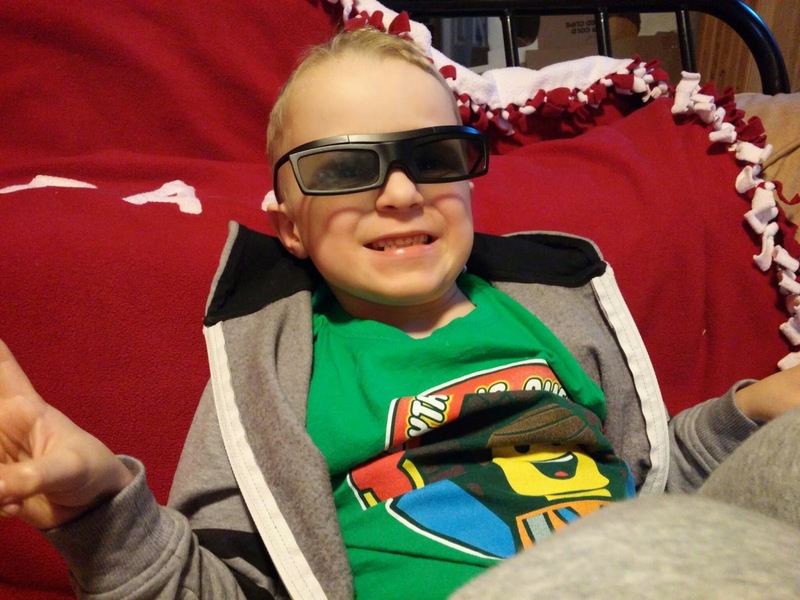 We watched a bunch of YouTube videos that were in 3D, the tricky part having to find one that was in 'real 3D'. There's a bunch of the anaglyph ones, or ones that are 3D for other types. 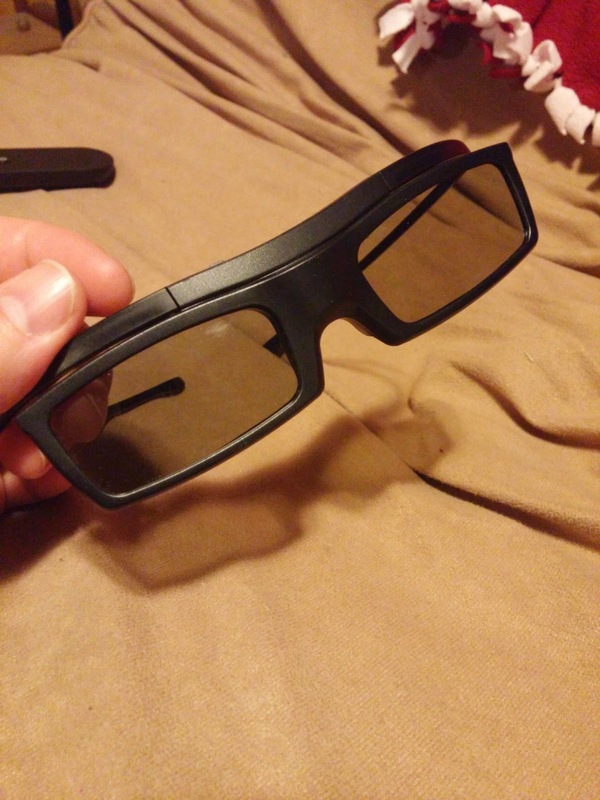 Like if I watched a Sony 3D video, I would have to hit the 3D button to tell it that it was in 3D. Some videos it would sense the nature and automatically put it in 3D if it saw that there were glasses connected. The glasses were nice, and not those super bulky ones you've seen elsewhere. Holding the power button on top connected it to the TV and would let you know it's battery level (although it got confusing if you were connecting a bunch of glasses all at once, you wouldn't know who's was who's and which battery was low - plus the display is only on for a second or so and then went away). But once connected, with the right 3D it was awesome. We watched a few Blu-Ray sample 3D on YouTube and seeing some videos was fine, but it was really the Pixar/Disney 3D ones that really shone thru. Anybody know of a 3D Blu-Ray player that supports DVD-Audio? If you're not watching 3D you can still turn it on for a 2D->3D simulated mode. It's definitely not 3D but it sort of works... I doubt I'd use it tho' myself. So, the SmartHub is awesome, but there's so much more to the TV here, that I doubt I could really fit it into one review. 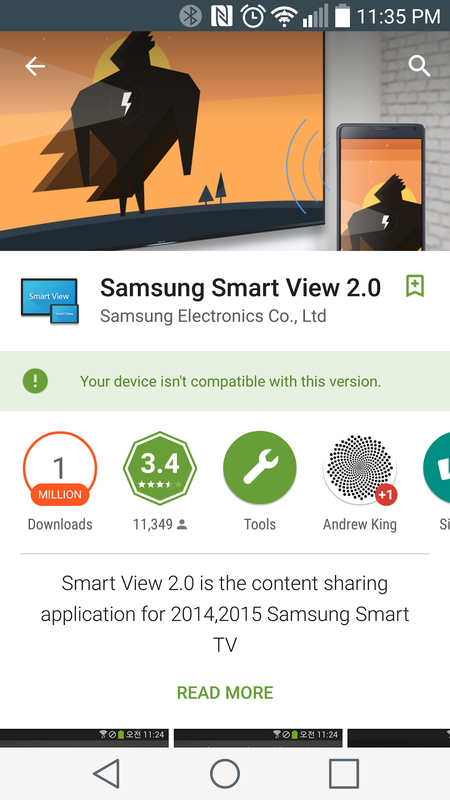 For those of you with a select group of Samsung devices, you can install SmartView. There's even an NFC tag in the remote control that'll bring you to it (if you haven't installed it first, it'll bring you to the Play Store, after that, it'll bring you directly to the app). I can't tell you how cool this is. But, I'll try. 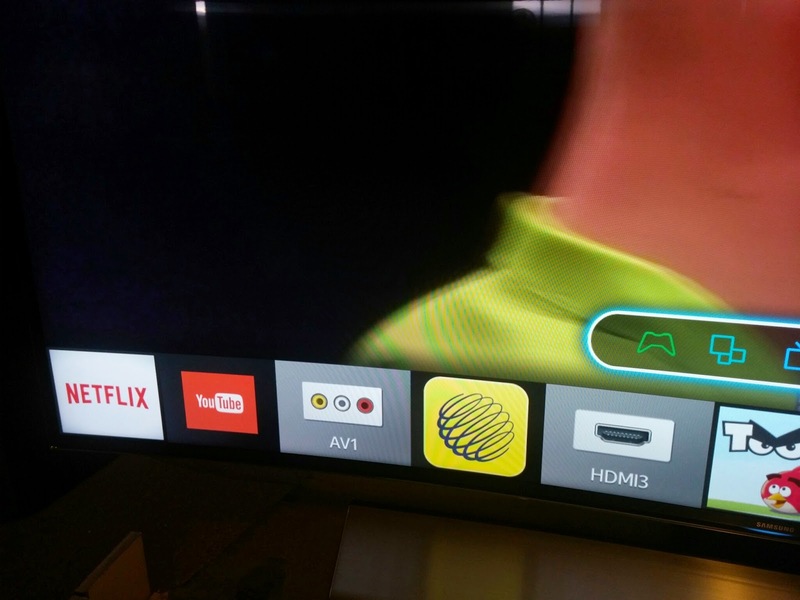 Essentially it's a remote app for the TV that mimics what the controller can do, but you also get to see what's on the TV. Yes... you could watch what's on the TV also on your tablet. Well, the TV would need to be on for it tho', but if you had to get up while nature called, you could bring your tablet with you and keep tabs on the score. (note: screenshotting the app won't blanks out what's on the screen tho' so I can't really show it off). If you want to do generic TV controls that's fine, but if you want to change channel via the set top box, you'll have to ensure that you set up the IR blaster. 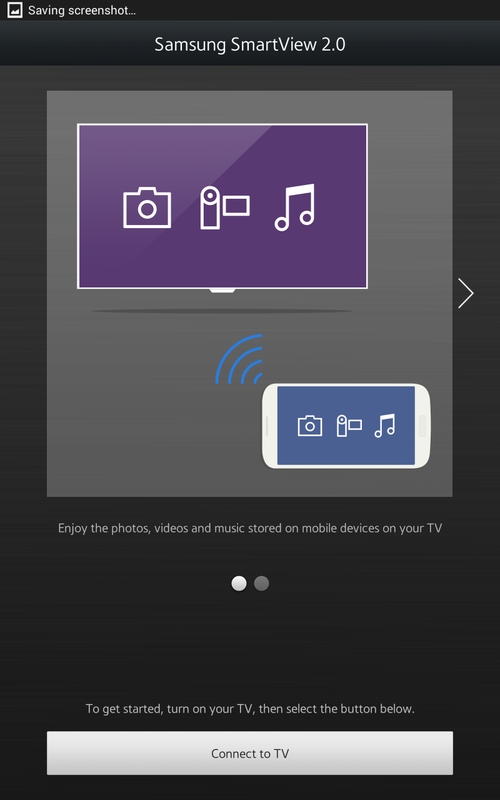 SmartView also has an option to 'throw' media from your device to the TV, without having to go through the DLNA/miracast set up again. Too bad it's only available for select Samsung devices - and luckily I had a couple that would work. Having a USB connection meant you can watch just about anything from your computer on to the TV (you just have to physically download it from a computer to your stick, then walk it over, plug it in... so archaic!). Any videos I threw on it just worked... no issues. Even 720p videos looks amazing. 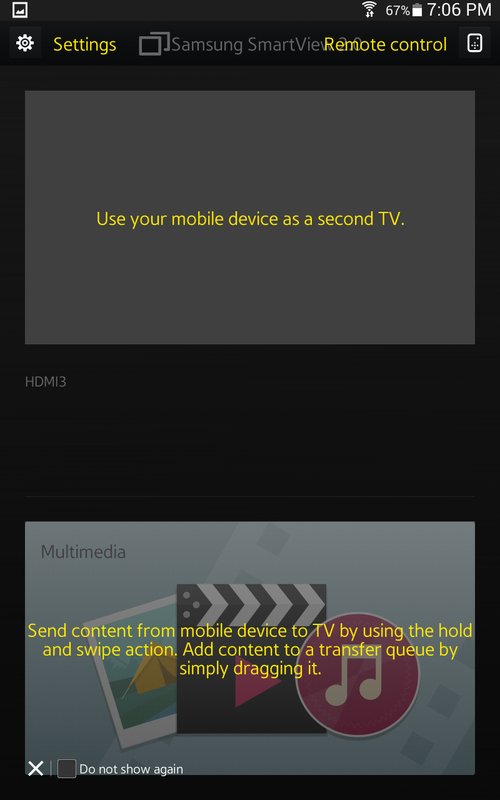 Speaking of 'throwing', you can connect your phone (if it uses DLNA/miracast) to the TV to mirror your screen. I was reviewing the Sony Z3 at the time and it was the easiest of any of the devices I tried to send pictures and video to. 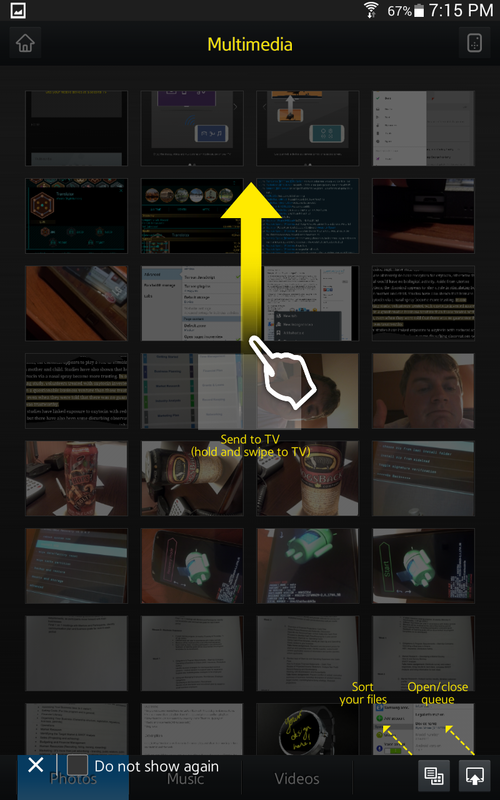 Videos worked the best, as for some reason, sometimes pictures would show up VERY TINY on the screen. If you have one of Samsung's SmartLink audio peripherals you can instantly connect to it and use it as your source of audio - you could even use multiple items for your surround set up if you had more than one. And it was all on screen for set up. VERY EASY. There's a cadre of other features, like the camera up top that you can use for physical (think Kinnect) gestures. I couldn't get it to work (tho' I do have a light almost above the TV which might cause some interference). There's Eco sensors in the set to help adjust brightness. 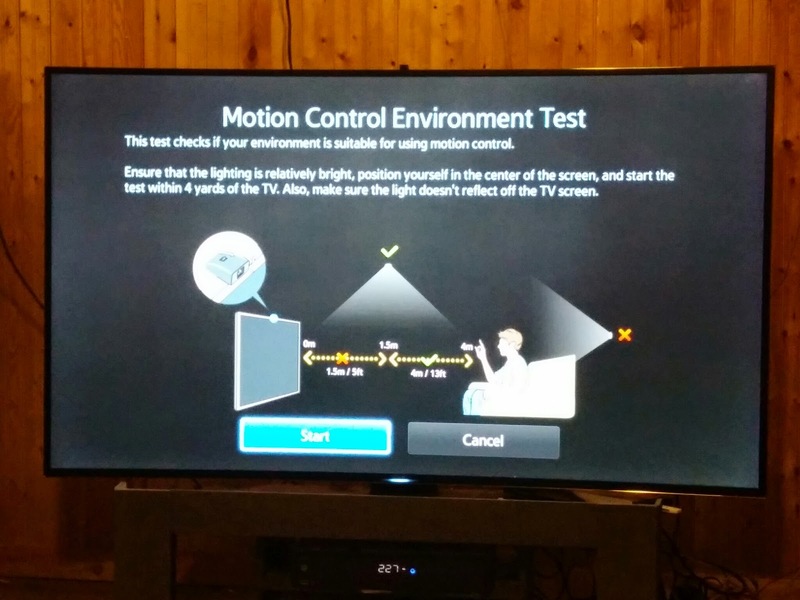 There's a mic button right on the remote, but I couldn't really get it to work (I was trying things like "Switch to HDMI1"... no go); again, it could have been something I just was doing wrong, but I felt I didn't need to use voice on my TV - I barely use it on my Nexus Player. 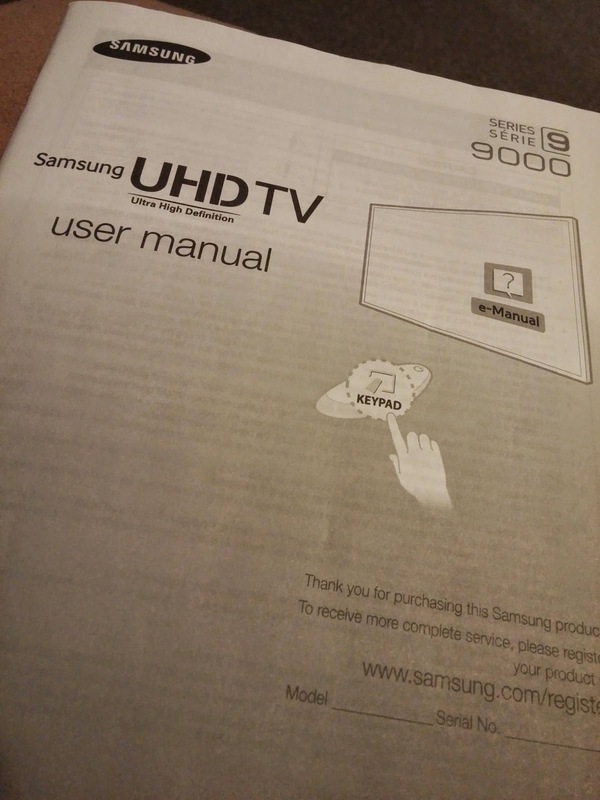 The manual is available as an e-Manual via the settings. You could even connect to 'remote support' through the TV where they can help diagnose issues 'on-the-line'. I was hesitant to review this TV, but I'm glad I was able to - you can see how it nicely rounds out any 'tech enthusiasts' smart home (next I'll have to get a Nest). Being able to showcase our pictures and videos on the screen was nice and without having to wait for G+ photos to upload them to our storage for streaming. Being an amazing picture allowed me to fall back in love with movies again too. For a long time now I haven't watched much TV and most of the movies I watched were on my devices. But, like photos are great to view on your small screen, they really belong in bigger housings, like photo frames, or on giant TVs! Same with movies. I was able to really connect into a movie and the quality of the picture allowed me to do that. Movies were real again. It's going to be hard going back. When I first started writing about the TV I was first a little off-put by the 'how real it was'. I had a whole paragraph in my mind about "there's a line when we watch TV that we want it to be unreal", but very quickly I dropped it as I think it's really the next evolution of what we expect (remember when folks complained about HD and how it'll be terrible to see all the celebrity's pores and wrinkles?). I'm going to fall back on a line I've used a few times... the resolution allowed us to be 'immersed' while watching. I didn't talk about picture quality (i.e. colour, brightness, etc..) because that stuff's highly subjective, and for what it's worth it was fine out of the box for me. If I really wanted to bring out the old TV sales rep in me again I could have tweaked it to perfection as the settings allow you a lot of control, but I didn't. One added feature of having this large, unique TV, was being able to bring friends and family into the house to watch TV. Sure, it was on the premise for me to get some of their input for the review here (you'll notice it wasn't much, most of what I got was "WOW"... and you can't write a whole review of just 'wow'); but it was nice to have friends gathered around in the basement watching TV, eating snacks. Something we really haven't done in a long time. I don't know if we do that as a society anymore. The evening plan of running out together to get a movie from Blockbuster (the walking around those stores and trying to pick a movie, let alone finding out if there was that one you wanted was actually there or not), getting snacks and then experiencing a movie together. I think Samsung's trying to bring that feature back to our lives ... and sure, this set will run you $4,000 (heh... 4k... get it? ); and that's more than the average person can afford, but I can't see myself settling for anything less now. Well, maybe I'd go for the 55" version.